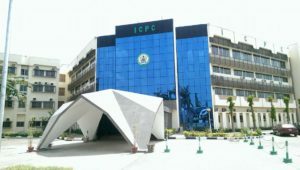 The Independent Corrupt Practices and Other Related Offences Commission (ICPC) has arraigned Mr. Afolabi Samuel Olufemi, a former lecturer at the Federal Polytechnic Ede, Osun State and his associate, Mr. Bashiru Aremu before Justice Wasiu Oladejo Akanbi of Osun State High Court 3, sitting in Osogbo for allegedly obtaining the sum of N13.3m from Tertiary Education Trust Fund (TETFUND) under the guise of running a doctorate degree in the United States of America (USA) before diverting it to personal purposes. When the charges were read in court, it was revealed that in January 2014, Mr. Afolabi, while serving as Head of Accounting and Finance Department of the Polytechnic with the help of his associate, Bashiru, who claimed to be the African Representative of Adam Smith University, USA, allegedly obtained the sum of N13,328,000 (Thirteen Million, Three Hundred and Twenty Eight Thousand Naira Only) from TETFUND under the pretense of running a foreign doctorate degree programme. Mr. Afolabi, who has since retired, diverted it to his personal use and was therefore charged for “engaging in criminal conspiracy to confer corrupt advantage upon selves contrary to section 26 (1)(c) and punishable under section 19 of the Corrupt Practices and Other Related Offences Act 2000”. Other offences allegedly committed by the accused persons under the Corrupt Practices and Other Related Offences Act 2000 were “fraudulent receipt of property contrary to Section 13 and punishable under Section 68; knowingly furnishing false statement in respect of money received, an offence contrary to Section 16; intent to deceive the Principal, contrary to and punishable under Section 17 (1)(c) and making a statement which is false to a public officer, an offence contrary to Section 25 (1)(a) and punishable under Section 25 (1) (b). The accused persons pleaded not guilty to all the charges and their counsel, Mrs. Olateju Kolawole and Mr. Oyewale Dauda thereafter requested for bail, which was not opposed by ICPC counsel, Mr. Sulaiman H. Abdulkareem and Mr. Kehinde Adetoye. Justice Akanbi granted bail to the accused persons in line with the terms of administrative bail earlier granted them by ICPC, with the condition that their sureties who were expected to be present in court must be civil servants not below Grade Level 15 and above, working within the jurisdiction of the court and they should also produce N5 million each in like sum. The trial was adjourned to 10th December 2018, for further hearing.